The electric mini was made to provide a solution for a zero emissions operation. The electric mini excavator was constructed by first taking a standard diesel powered unit and then, through the talents of our equipment division, the unit was modified to its current state. The diesel engine was removed and in its place, a 480 volt, 3 phase drive motor was installed. Extra cooling was added to facilitate operation in tight quarters. The unit was then rewired and transformers added to operate multiple variable DC voltage systems. The versatility of this machine allows it to be powered from existing facility worksite power. It can be run from power generated by one of our full-service self-contained trucks, or when access is limited it can be powered remotely by a diesel generator. The excavator also has the capability to run a wide range of standard attachments like a hydraulic breaker hammer, hydraulic clamp, as well as grading and digging buckets. 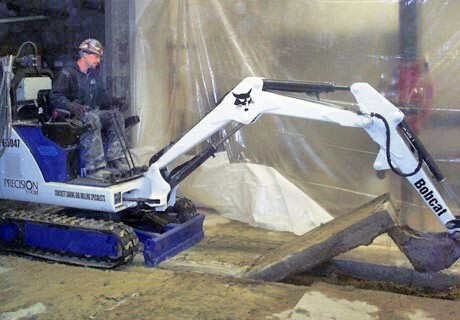 Our electric mini excavator is an ideal unit for a multitude of applications, such as hospitals, schools, retail stores, confined spaces, or anywhere proper ventilation of a conventional machine is not possible.